Following the nation's entry into World War II, President Franklin D. Roosevelt requested that states' separate employment services be centralized into one federal agency responsive to the demands of national defense. Effective 1 January 1942, the records of the State Employment Service Division and various other personnel under the North Carolina Unemployment Compensation Commission (UCC) were transferred to the United States Employment Service under the Social Security Board. The following year, the General Assembly empowered the UCC to cooperate with other unemployment compensation agencies and to make reciprocal arrangements with agencies of the federal and other state governments. In 1947 the General Assembly changed the name of the State Employment Service Division to the Employment Security Commission (ESC) and vested it with all powers and duties previously granted to it as the Unemployment Compensation Commission. Correspondence, financial reports, speeches, articles and other documents relating to the Unemployment Insurance Division of the Employment Security Commission. The correspondence concerns the merger of unemployment compensation funds for over forty railroads and the administration of the Servicemen's Readjustment Act of 1944. Other miscellaneous records include status reports from various divisions, reports on group layoffs in North Carolina, deliquent employers, procedure for charging proportional benefits to former employers, and resources available through the Unemployment Compensation Commission in North Carolina. In 1921 the General Assembly called for the establishment of an Employment Bureau within the Department of Labor and Printing, the first free employment service in the state to receive funding from both the state and the federal government. The commissioner of labor and printing was authorized to contract with local authorities for the establishment of branch employment offices and to cooperate with and accept aid from certain agencies designated by Congress to assist the unemployed. The commissioner was also charged with collecting data and generating statistics on various labor topics, including unemployment. In 1931 the General Assembly abolished the Department of Labor and Printing and transferred most of its functions to the newly established Department of Labor under the administration of a commissioner of labor. In an attempt to address the nation's severe unemployment problems during the era of the Great Depression, Congress enacted the Wagner-Peyser Act of 1933. It provided for the coordination of all local, state, and federal employment agencies into a comprehensive system directed by the U.S. Employment Service within the federal Department of Labor. Subsequently, in March 1935 the General Assembly amended the legislation establishing the Employment Bureau and empowered the commissioner of labor to cooperate with the U.S. Employment Service and other agencies under terms required by the recent federal legislation. This amendment established the State Employment Service and required it to offer vocational guidance in addition to job placement services. In May 1935 the General Assembly directed the governor and Council of State to select a means of administering an unemployment compensation fund, an action that anticipated the passage of federal unemployment insurance laws. The following August Congress enacted the National Social Security Act, with various provisions for unemployed workers under Titles III and IX. This legislation declared a mandatory federal excise tax on employers with payrolls carrying eight or more workers and authorized qualified state agencies to receive federal grants through the U.S. Department of Labor and to administer tax-based funds to the unemployed who met the conditions required by the Social Security Act. A federal Social Security Board was established to administer the act and to set standards for participating state agencies. Subsequently, the Social Security Board took over the U.S. Employment Service and thereafter followed a course of coordinating job insurance with a program of job placement. In response to federal initiatives and requirements, the General Assembly called a special session in December 1936 and established the North Carolina Unemployment Compensation Commission (UCC). The commission's primary function was to provide aid to those out of work by circumstances beyond their control and to continue to fund such assistance in consonance with federal directives. The UCC was to consist of two gubernatorial appointees and the commissioner of labor, with a chairman designated by the governor from among these members. Following the initial staggered terms, terms of appointed board members were to be for six years. Other powers and duties of the UCC included the following: to adopt administrative rules and regulations; to submit an annual report to the governor including any recommended legislative amendments; to publish relevant laws, rules, regulations, and reports for public distribution; to prescribe the records to be maintained by employers, which were to remain open to inspection by the commission; in disputed cases, to issue or authorize a representative to issue subpoenas requiring attendance of witnesses and the production of records with the backing of the state's courts; and to cooperate fully with the Social Security Board and all other federal agencies charged with the administration of public works or assistance through public employment. The law permitted judicial review of the commission's decisions through appeal to the superior court in the aggrieved party's county of residence. The Unemployment Compensation Law of 1936 also provided for the establishment of two separate administrative units within the UCC: the State Employment Service Division and the Unemployment Compensation Division. The former division was the successor of the State Employment Service established in 1935. Subsequently, two other components were added for legal and administrative purposes: General Counsel, created to advise the commission and to represent it in court proceedings; and the Bureau of Research and Statistics, charged with supplying data required by federal law. The UCC was also empowered to establish state and various local advisory councils to discuss problems and to help formulate policies related to the administration of the unemployment act. 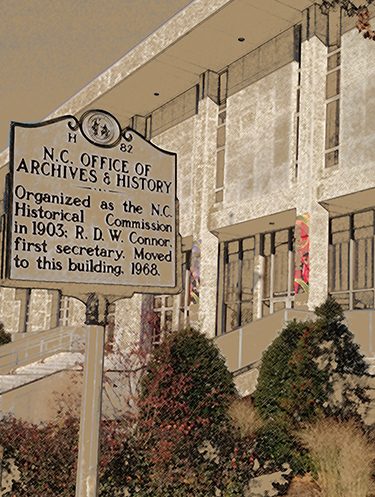 In 1938 the North Carolina Merit System Council was created to handle the personnel work of the UCC and was subsequently expanded to do the same for other agencies required to maintain federal employment standards. In 1939 the General Assembly extended the UCC's quasi-judicial powers, stipulating that its decisions, when docketed by a clerk of court, carried the same force as a judgment of the superior court. Subsequently, the legislature in 1941 removed the commissioner of labor from service on the commission, changed the number of gubernatorial appointees from two to seven, reduced members' tenures to four years after initial staggered terms, and specified that none could simultaneously hold a position with any political party. Following the nation's entry into World War II, President Franklin D. Roosevelt requested that states' separate employment services be centralized into one federal agency responsive to the demands of national defense. Effective 1 January 1942, the records of the State Employment Service Division and various other personnel under the UCC were transferred to the United States Employment Service under the Social Security Board. The following year, the General Assembly empowered the UCC to cooperate with other unemployment compensation agencies and to make reciprocal arrangements with agencies of the federal and other state governments. The State Employment Service Division was returned to the UCC in November 1946. In 1947 the General Assembly changed the name of the agency to the Employment Security Commission (ESC) and vested it with all powers and duties previously granted to it as the Unemployment Compensation Commission. [Identification of item], 45.8-9, Employment Security Commission, Unemployment Insurance Division, State Archives of North Carolina, Raleigh, NC, USA. Includes correspondence, financial reports, miscellaneous reports, speeches, articles and other documents relating to the Unemployment Insurance Division of the Employment Security Commission. The correspondence (1939-1940, 1945-1953) is that of the director of the division and concerns the merger of unemployment compensation funds for over forty railroads into a Railroad Unemployment Insurance Account and the administration of the Servicemen's Readjustment Act of 1944. The financial reports (1937-1954) include carbon copies of monthly analyses, summaries, reconciliation of accounts, trial balances, and lists of overpayments and of bank checks from employers. Other records include: status reports from various divisions; reports on group layoffs in North Carolina (1951-1957), deliquent employers, procedure for charging proportional benefits to former employers (1939), and resources available through the Unemployment Compensation Commission in North Carolina; a speech by Maj. Arthur L. Fletcher to the N.C. State Federation of Labor (ca. 1941); and a paper by William R. Curtis on the "Unemployment Compensation Experience in the South" (1939). Carbon copies of correspondence (1939-1940) of the chairman of the Unemployment Compensation Commission, including letters, memoranda, a press release, and various computations relating to the merger of unemployment compensation funds for over forty railroads into a Railroad Unemployment Insurance Account to be administered by the National Rail Road Retirement Bonds, and the transfer of funds already collected by the state. Also carbon copies of correspondence (1945-1953) of the director of the Unemployment Insurance Division with the Readjustment Allowance Service of the Veterans Administration in Washington, D.C., discussing administration of the Servicemen's Readjustment Act of 1944. Subjects include retraining programs for veterans, disqualifications, readjustment allowance for the self-employed and farmers, paperwork, audits, and problems of joint federal-state operations. Carbon copies of financial reports (1937-1954), including monthly analyses, summaries, reconciliation of accounts, trial balances, and lists of overpayments and of bank checks from employers. Miscellaneous records include status reports from various divisions; reports on group layoffs in North Carolina (1951-1957), deliquent employers, procedure for charging proportional benefits to former employers (1939), and resources available through the Unemployment Compensation Commission in North Carolina; a speech by Maj. Arthur L. Fletcher to the N.C. State Federation of Labor (ca. 1941); and a paper by William R. Curtis on the "Unemployment Compensation Experience in the South" (1939). Speech made to the North Carolina Federation of Labor by Maj. Fletcher, n.d. Developments in Employer Experience Rating in Unemployment Compensation in North Carolina, , n.d.
Building and Maintaining Morale, n.d.